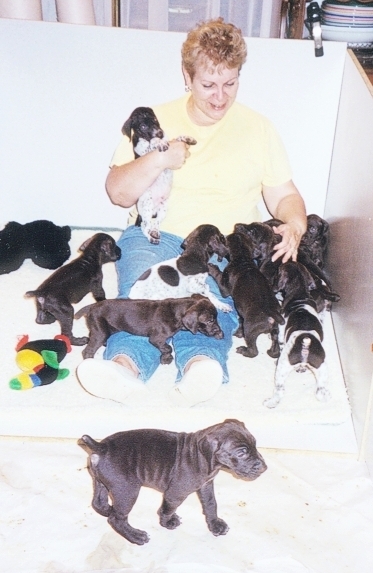 There are so many key factors that go into the early developmental stages of the GSP puppy. And by no means do I intend to imply that I am an authority on the subject. That isn't my intention in writing this article. I mean it simply as an overview of some very basic principles that have worked well for me. 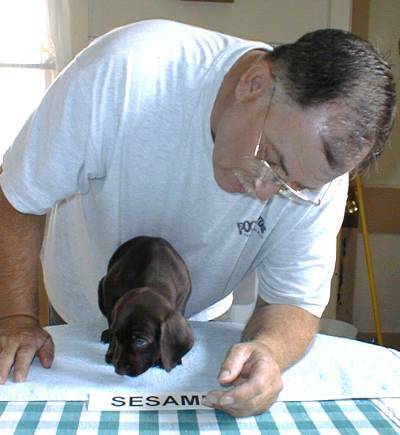 Over these many years in the breed there are some things that I like to feel I have learned to do well and raising well behaved, happy and well adjusted puppies that grow into happy and well adjusted mature dogs has been an ongoing endeavor and primary goal for all of my years of breeding. It can be said that every cause has an effect of sorts when it comes to the imprint that we as humans have on puppies and from the moment of birth it is no different. They are born with their own set of physical and emotional genetic characteristics that set them apart from one another as individuals. What we do to make their first contact with humans a pleasant experience is crucial from their very first moments after birth. On a personal level my belief is that the less we interfere with the process of being born, the better ... unless there is an emergency that warrants our involvement. The dam knows perfectly well the role that she needs to play and as difficult as it might be, we need to allow it to happen as naturally as possible. If she is a novice at motherhood, the reality sets in rather fast as most longtime breeders know, and she soon learns what she needs to do. After the dam has cleaned them, which in some cases leads us to feel that she will most certainly lick every hair from their body, they soon find their food source and all is right with the world. After they have settled, nursed and rested and the whelping process is over, it's time for me to take my first good look at the little creatures who will be my charges for the next eight weeks. This is the best time for a cuddle and for allowing the dam to know that you are there to help her. The "imprint" is immediate. Their bond with you is immeasurable at this time and so it is extremely important that they feel what you are all about. At this time in their new lives, it really is their most vital sensory perception of something other than their dams or their siblings. It needs to be a warm and positive point of contact in every sense of the word. 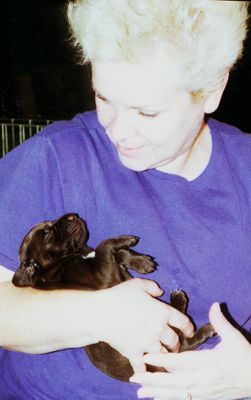 From that very first day, I hold each puppy very securely and and close to the warmth of my body. I speak to them in soft tones and let them know how they are loved and appreciated; all the while noticing every small feature and unique marking that make them special. I handle them often throughout the day and sometimes at night if they seem restless as I sleep only feet from their box for their first 4 weeks. Here again, I have the luxury of keeping them in our home rather than outside in a shed, a barn or a kennel building. Turning one's home into a temporary "kennel" isn't for everyone and I respect that. But ... it's what we choose to do here and it works for us. The following weeks allow for simple quiet times assuming that the whelping was normal and no special medical care is needed for mother or babies. The cuddling, holding and feeling these soft little creatures is food for the soul. Their reliance on their humans as well as their dams is unmistakable as time passes from days into weeks. They look to us for additional tactile association. This affords us the opportunity to give them the stimulus they will use later in their lives to define what is good, pleasurable and acceptable or what they might percieve to be harmful and clearly negative in nature. As these soft little lumps turn into four-legged whirlwinds during the following weeks, it becomes harder to contain them as they look to explore every nook and cranny exposed to them. Still ... the contact that they have with us should always be pleasurable and positive as they internalize your every move and gestures. Dogs as we all know are pack animals and body language plays a crucial role in their perception of pack order and acceptance. Basic logic leads me to believe that it is not so different in their associations with us as well. I watch them as they begin to explore their world and it can provide hours of non-stop entertainment indeed. I watch to see who becomes bold as they approach the unknown and who scurries back for safety in my arms and words of assurance. I watch the puppy or puppies that follows and those that lead. Which puppy stops at the sound of a loud noise and which is undaunted by it all. Which puppy interacts and socially accepts his or her littermate as an equal and which chooses to be superior. Watching each puppy surmount the physical obstacles that I've built for them to conquer alows me to know which will be open to tackling the obstacles that life hands them. And when I call, which puppy comes dashing back with excitement; knowing that I'll be scooping them up in my arms and singing their praise. The field is yet another world they have to explore and when your initial bond with them has been a positive one, their character in the field allows them to navigate by their own controls with your guidance and assurance as their safety net. They stay too close, they run too far, they chase frogs and butterflies, they jump on your legs, they eat sticks, the potty endlessly and it seems as if they do everything they can to frustrate the pants off of you. But, as they grow and develop over months and years, those early hours and days you spent in giving them the positive imprint they needed will serve you well as you begin the training that allows them to become a superior gun dog. It all goes back to those first hours, those first days and those final weeks before going to their new homes, as they grew to know you and you had the honor of becoming the first positive and intimate influence in their lives aside from their mother. So many times I have heard people say that certain days are so important in the development of a puppy and what he will become in the future. They must get their new puppy by a certain day. I choose to believe that while certain time frames in a puppy's development might be important, overall it is the very early hours and days of their lives and their association with us that can ultimately determine their personalities and their attitudes as they mature. In the grand scheme of things, it really doesn't matter if they will eventually be gundogs, show dogs, obedience and agility competitors or just great family members and companions. Any way you look at it, the bottom line is that they become great representatives of our breed and that they reflect the care and love they have come to deserve. It can be heartwarming and fulfilling to know that your decision to bring them into this world has been a labor of love and that you've done everything possible from that first day to make it a positive and wonderful experience for those who will live with them and love them for years to come. It doesn't matter if you've bred many litters or you are just beginning the adventure. 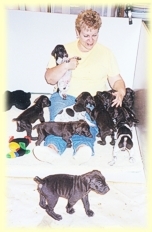 It's an important part you play in making the world a better place for German Shorthairs to live and thrive. 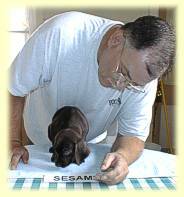 To see an illustrated guide to puppy development click here.